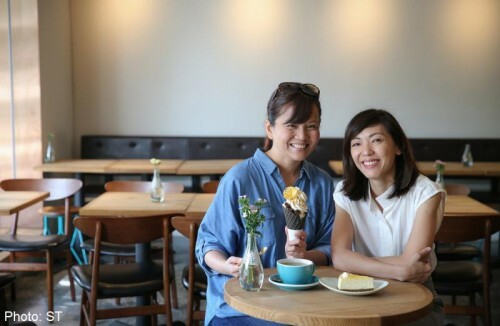 Their three-year-old ice cream cafe in the heartland of Toa Payoh has been doing so well that Ms Khoh Wan Chin and her two partners behind Creamier have opened a new cafe. Sunday Folks, in trendy Chip Bee Gardens, is the next part of their plan to grow the company sustainably. "We want to be a serious player in the F&B market so we have to invest and make the business attractive to good talent," said Ms Khoh, 38. Her two partners are also in their late 30s. In 2011, they poured more than $250,000 of their savings into a Housing Board shop unit, after deciding the neighbourhood might take to a "chill" cafe. They started off working eight to 10 hours straight in the kitchen to prepare homemade ice cream and waffle mixes. "We take a lot of pride in our product and pay attention to details," said Ms Khoh. For instance, they display their sorbet in smaller pans so the turnover is faster and it is always fresh. After one of their flavours was highlighted in the media, word spread. The trio were able to recoup their capital and open the second cafe in July, for around $750,000. To manage the manpower crunch, they invested in an electronic tracking system for Creamier to tell servers where customers are seated, and a queue system at Sunday Folks which alerts customers when their table is ready. Ms Khoh noted that running a design agency for 12 years has helped hone her business acumen and people skills. And one of her partners, Ms Audrey Wang, is a trained patisserie chef with realistic expectations about working in the food and beverage line. Said Ms Khoh: "It's not just about being passionate, you have to know how to respect and trust each other as partners."